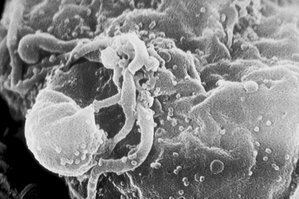 Although treatments for both AIDS and HIV exist to slow the virus' progression in a human patient, there is no known cure. Most researchers believe that HIV originated in sub-Saharan Africa during the twentieth century; it is now a global epidemic. UNAIDS and the World Health Organization (WHO) estimate that AIDS has killed more than 25 million people since it was first recognized on December 1, 1981, making it one of the most destructive pandemics in recorded history. In 2005 alone, AIDS claimed between an estimated 2.8 and 3.6 million, of which more than 570,000 were children. In countries where there is access to antiretroviral treatment, both mortality and morbidity of HIV infection have been reduced . However, side-effects of these antiretrovirals have also caused problems such as lipodystrophy, dyslipidaemia, insulin resistance and an increase in cardiovascular risks . The difficulty of consistently taking the medicines has also contributed to the rise of viral escape and resistance to the medicines . 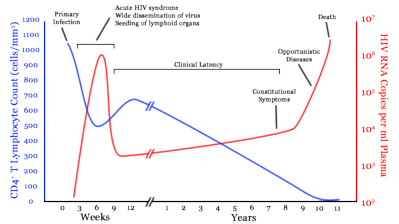 In the absence of antiretroviral therapy, progression from HIV infection to AIDS occurs at a median of between nine to ten years and the median survival time after developing AIDS is only 9.2 months . However, the rate of clinical disease progression varies widely between individuals, from two weeks up to 20 years. Many factors affect the rate of progression. These include factors that influence the body's ability to defend against HIV, including the infected person's genetic inheritance, general immune function , access to health care, age and other coexisting infections . Different strains of HIV may also cause different rates of clinical disease progression.